Old lab coat from my dad's lab, since mine is in TCOCC. Her dad did not mysteriously disappear, nor did she have an Uncle Ben, and she was bitten not by a radioactive spider, but rather by the sewing bug. 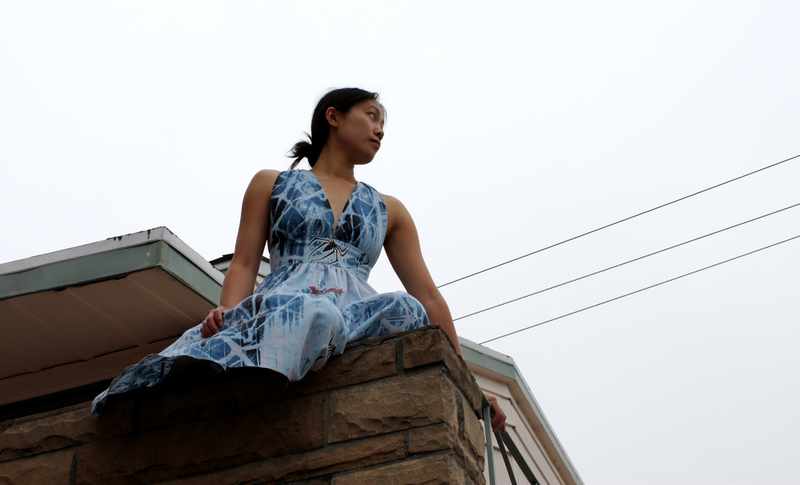 Her love for superheroes and nerdfighteria led her to transform into the amazing Cationess, fighting sartorial monotony and throwaway culture by making unlikely dresses out of thrifted sheets. My superhero pose is kind of spoiled by the fact that I'm holding onto this pole for dear life. I couldn't bring myself to walk any farther out on the the ledge. Oh my goodness, is that a thrift store sheet in need of recycling? I will save it by making it up into an unlikely dress! She was privileged to learn from a much greater seamstress, Tanit-Isis, but unlikely circumstances (aka fortuitous thrift store finds on both their parts) led to a showdown between the n00b and l33t. Gearing up for take-off...apparently taking off involves spinning around, not unlike the Sailor Moon transformation. Taking off to fly to Canada! Where I would promptly freeze to death, of course. Can you tell how cold I am in all these shots? Okay, I can't stand writing this artificially dramatic third person narrative about myself anymore. So yeah, in case you couldn't tell, Tanit-Isis and I decided to both sew up some Spiderman dresses in anticipation of the new Amazing Spiderman movie (although, can it really be called "in anticipation" if it's after the movie's already come out?). 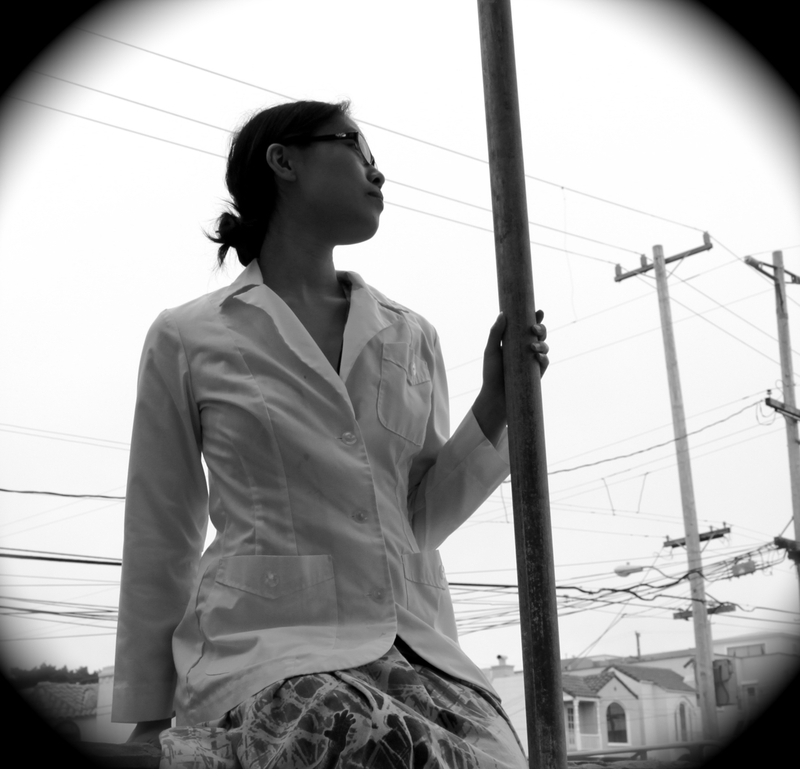 I'm so excited to be able to do this sewalong of sorts with her -- she's seriously one of my sewing heroes. 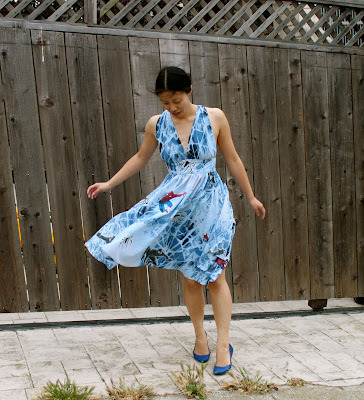 Her blog was actually the second sewing blog I ever discovered (the first was the Selfish Seamstress, and it was her account of Tanit-Isis' awesomeness that pulled me in), and I could just gush forever about her jeans, coats, and retro dresses. I won't, though, for fear of sounding like one of those creepy groupies who know their victim's idol's blood type or some such nonsense. I'll just leave it at this: when she first started commenting on my blog, I was *almost* as excited as when Ryan North tweeted my Superman dress. Anyway, to call this a throwdown seems laughable. It's like if Aquaman was in a fight with oh, any other superhero. It's a showdown like the back of my midriff panel -- evil Spidey vs. good Spidey! just the right time to show off its fullness. Anyway, for those of you who care (not Shayna, although she was the one who graciously gifted me these sheets), I made my dress from the OOP Vogue 7521. I used the View C back strap pattern with the View A length, replacing the straps with black soutache cord in order to mimic Spiderman's signature webbing. Unfortunately, trying to get the correct tension on all six cords was extremely difficult; it's still not quite right, but I don't know if I have the mental energy to try fiddling around with it anymore. All of my insides are finished so nicely, I can't bear to think about ripping it open to fix that one cord. I'm also not a fan of how much excess fabric there is at the top of the bodice pieces (they're too thick to really count as straps, but not thick enough to count as reasonable coverage), but otherwise this dress turned out as I hoped. Fabric: Cotton-poly blend thrifted twin sheets (despite having both a flat and a fitted sheet to work with, there was still some tricky cutting to avoid...questionable spots). Hours: Nine or so. I spent at least an hour adjusting and readjusting and basting and ripping the cords, and then slipstitching the lining down by hand was another hour. I keep feeling like I should be making these up faster, but I find that I'm really enjoying taking the time to finish all my seams properly, even if that means I'm sewing up each seam multiple times. Will you make this again? I like the idea of this dress, especially the back shoulder drapes in View C, but as a full-length evening gown. However, 1) I don't need any evening gowns, and 2) the triangle bust pieces leave something to be desired in terms of amount of excess fabric...so the answer is maybe, but only if there's a specific occasion and I have time to redraft the bust pieces. Total cost: Shayna gave me these sheets as a gift, so it only cost me $2 for the zipper and cording, but if I factor in the cost of the sheets, it rises to all of $5. 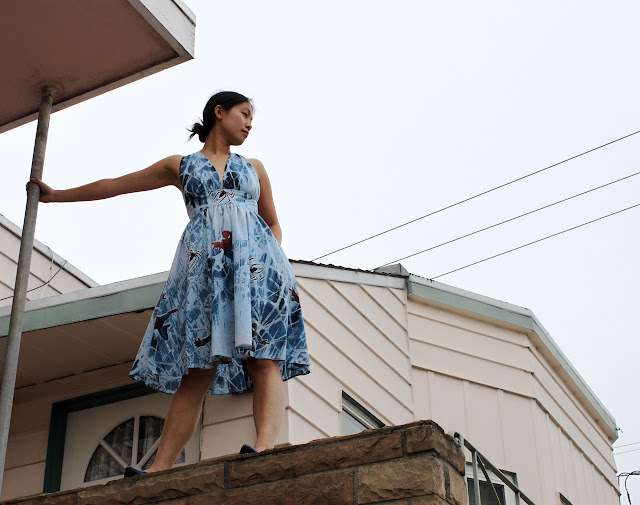 Final thoughts: Spiderman isn't my favorite superhero, and this dress is a little too exposing for regular wear (especially in foggy San Francisco summers! ), but it was fun to see this idea turn into reality. I do like the fullness of the skirt, but if I plan to wear it again I'm going to need to invest in some bike shorts or tap pants -- the wind has entirely too much fun with it -- as my husband had to work hard to not get scandalous shots. I really, really wish I was going to Comic-Con this year so that I could have a good reason to wear this, but alas, one of the downsides to being in my favorite city is that it does not host Comic-Con. Also, I don't think we're going to be seeing the new Spiderman movie in theaters, as he's not my husband's favorite, either...would it be terribly wrong to wear this for the Batman movie? Not especially confident superhero face for an idea of dubious quality? I love how this turned out, especially the back with the web-inspired detail. That fabric is really cool! I like that it is a somewhat subtle Spiderman print that at first glance looks like tie-dye in shades of blue. The style-lines of the dress are really pretty on you. I like the idea you had for the "web straps" in back. =) Maybe it would be a little easier to wear (coverage-wise) with a sweater later. lol - "would it be terribly wrong to wear this for the Batman movie?" I would be a little afraid it would make the batgeeks mad, but who knows? I'm not really close friends with any diehard comic book superhero fans. You are MY superhero Cindy. I think if they gave out "Makes Magic with Sheet" awards you would sweep it. I can see how the triangle is a smidge wide at the top but I think it looks amazing on you! The cord in the back is an inspired touch. You gotta wear this to the movie if only to have Spidey fan boys lose their sh*t. Also, I wouldn't worry about it being too exposed -it's actually quite modest overall. A little flash of back is sometimes the most alluring thing of all - too bad it's too chilly to just wear as a daydress in SanFran. 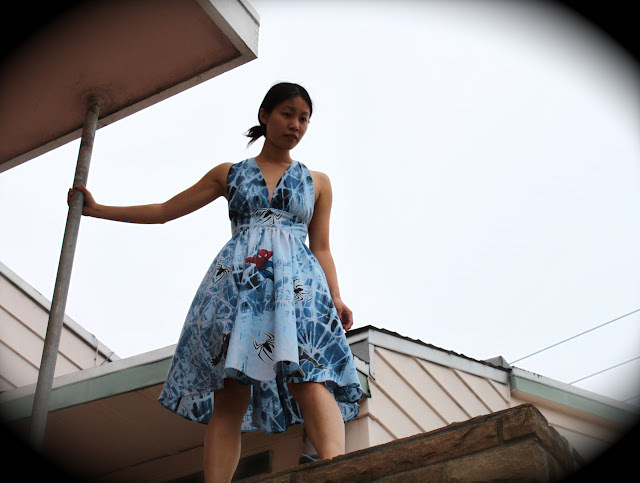 It's really cute, and the back straps are a fun surprise, I didn't even see the spiderman images at first - it just looked like a really cool batik print. Maybe it could be toned down Halloween costume (with a black long sleeve tshirt underneath)? TOTALLY TOTALLY AWESOME! I think I just got pwned. :D I love your fabric so, so much, so swishy and swingy and I love your webbing on the back! I especially love Spiderman and Symbiote going at it across the back zip! And I'm all totally blushing over all those praises. That post where Her Selfishness linked me was actually the first time I had more than 30 hits on my blog, EVER, and to this day remains my single highest viewership day of all time. I'm not sure my budget is going to cover the Spiderman movie in theatres, either... /sigh. Love it love it love it. 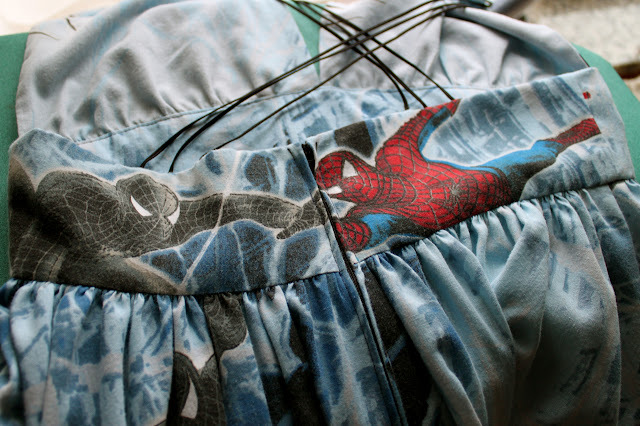 Back in high school I sewed myself a Spiderman skirt with a bedsheet and--wait for it--an overlayer of spiderweb-textured tulle! It was my favorite piece of clothing for a while there. 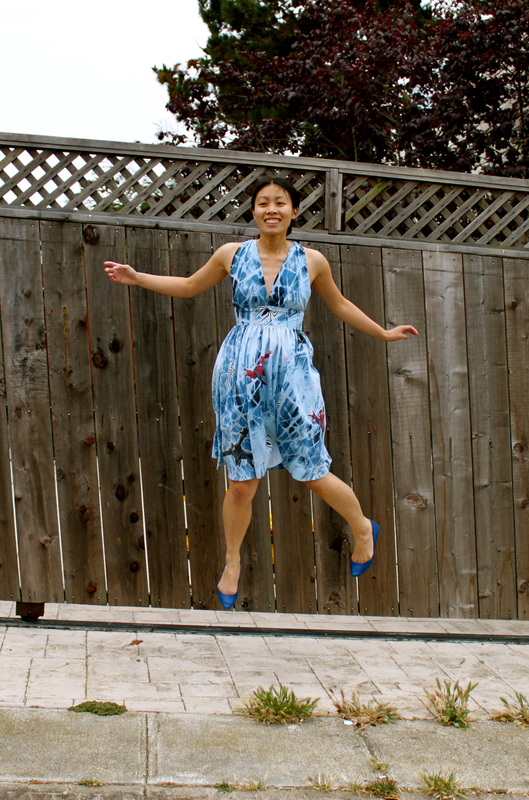 This dress makes me happy, as it's the same principle but in a form a non-14-year-old could wear. oh! venom showdown in the back, and still naughty spidey in the front! (excellent placement, there). i LOVE that cording. and your post is of course ridiculously entertaining. 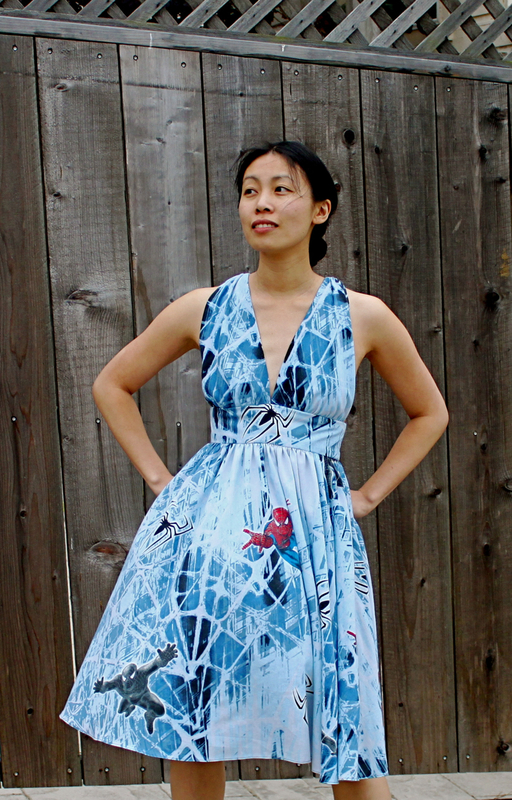 That is one amazing Spiderman dress! Gorgeous and you even do your own stunts!! Yay for another awesome sheet dress!!!! And great action shots. Cindy I absolutely LOVE LOVE LOVE ur fabric!!!! Hahaha "questionable spots" EW! I agree with the other commenter, I didn't realise Spiderman was on the fabric till I looked closer, just looks like a beautiful tye dye. Great job and as always, love your work! And I love the shots of u on the roof/ledge thing!! So brave!!!! OH, this is amazing! I love the dress print, it looks so artistic and the black cording is a gorgeous touch! I feel you on getting the cords at an even tension, though...it's because our backs aren't all one long straight plane so putting them in at the same length doesn't really work. I probably would have just measured them, sewn them in all at the same length and called it a day. So wonderful! Love the dress and the posed photos! Adorable. Good gracious, I LOVE IT! The battle for good and evil on the back midriff panel is positively geektastic. The style is pretty incredible, you rock it 100%, and the back cords remind me of the webbing Spidey shoots out of his wrists. Your superhero dresses make my heart so very very happy. Awesome. SO awesome! I love this dress, and your write up is hilarious! Spider man in love with Marilyn Monroe. What a nice story! Beautiful Dress!!! I hope you find some more superhero sheets to make more awesome dresses :). Also, I love that you are a nerdfighter :). Its so unexpected to find a little corner of nerdfighteria on a sewing blog haha! Can't wait to see what you'll make next & DFTBA. So cute! I have to admit that the first time I saw the back I was like "woaaah...that's a lot of skin for SF!" It does need spiderweb patterned tap pants! Guest Posting at Sew Country Chick! Leonora's Perfect Pants, My Eye.